The Tragic Accident of the Fishing Boat "Lucky Dragon"
Before dawn of March 1st in 1954, the U.S. hydrogen bomb "Bravo" blew up at the Bikini Atoll in the Marshall Islands. The power was 1,000 times more than the A-bomb on Hiroshima. The Daigo Fukuryumaru (the Fifth Lucky Dragon), a tuna fishing boat, was operating near the Rongelap Atoll, which was thought to be outside the warning area and was about 160km away from Bikini Atoll. A few hours later, radioactive pieces of coral reef called "Ash of Death" poured down on 23 crew members of the boat. Something strange appeared on their body on the way to their mother port, Yaizu. As March 14 approached, the arrival date in Yaizu Port, almost all crew members' skin became inflamed, they felt listless, they were vomiting, and their hair fell out. After entering the port, a doctor diagnosed that all of them had acute radiation diseases. They were transferred to Tokyo University Hospital and the National Tokyo Daiichi Hospital from a local hospital. On September 23 of the same year, Aikichi Kuboyama, radio operator of the Fifth Lucky Dragon, died of lung failure despite the Japanese people's wishes for his recovery. Piecing together detailed-analyses of the crew members' activities on the boat, scientists calculated how much radiation an individual crew member was exposed to. According to their calculation, the highest was 710 roentgens and the lowest was 170 roentgens. 700 rem (one roentgen is almost one rem) is a fatal dose for humans. A semi-lethal dose is 400 rem. Judging from that, we can understand that the Fifth Lucky Dragon was exposed to a high level of radiation. In May 1955, 14 months later after they were exposed to radiation caused by the U.S. H bomb test near Bikini Atoll, all 22 crew members left the hospital. But doctors in charge emphasized the following three points: the difficulty in forecasting the patients' prognosis, need of long term observation, and that leaving the hospital does not mean recovery. So, how is the victims' progress since then? As of today, 11 members including Kuboyama have died. The number is nearly a half out of 23 members. Eight out of 11 died of liver diseases such as liver cancer. Two other people, one who died in an accident and one who died of a cerebral infarction suffered from cirrhosis and liver function problems respectively. The average age of the 10 dead crew members was 56 years old, too young to die of liver cancer. The right course would have been to demand compensation from the U.S. for the Fifth Lucky Dragon. But the U.S. government argued that their action was not against international law. In the same manner, the Japanese government failed to blame the U.S. for its responsibility for damages to the victims of the H-bomb test. The Japanese and the U.S. governments, with exceptional speed, came to a political settlement in regard to fishery compensation of 2 million dollars. The crew members were paid between 1.91 million yen and 2.29 million yen in compensation, but expenses spent until that time were subtracted from the compensation. 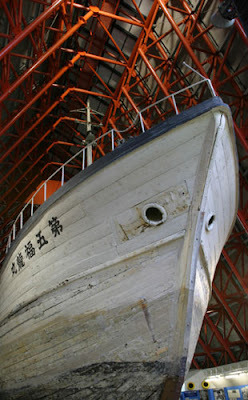 In a political settlement, which was reached behind their backs, ignoring their human rights, the crew members of the Fifth Lucky Dragon ceased to be Hibakusha, although they were undoubtedly Hibakusha. They have been until today without receiving any Hibakusha relief measures. Almost all survivors are infected with C-type hepatitis from blood transfusions given as a remedy after the radiation exposure near Bikini Atoll and they must live with the ongoing anxiety about possible aftereffects of the radiation. In this context, anti-nuclear weapons activists in Shizuoka Prefecture formed an association to support Hiroshi Kozuka, former crew member who has been hospitalized repeatedly because of his C-type hepatitis. Consulting with the Liberty Lawyers Guild (Jiyu Hosodan), we applied for "seamen's medical insurance" as a minimum compensation. The Shizuoka Prefectural government unjustly rejected this application. But our persistent efforts succeeded in urging the Social Insurance Appeals Committee of the Health and Welfare Ministry to accept Kozuka’s claim. The Committee over-ruled the Shizuoka governor's decision. Then, Matashichi Oishi who now lives in Tokyo applied for the same insurance to the Shizuoka Prefectural government and his claim was also accepted. Such an epoch-making victory was the first step towards realizing relief measures for the crew members of the Daigo Fukuryumaru (the Fifth Lucky Dragon). Aikichi Kuboyama, the first victim of the H-test, said in his will that he would be the last victim of A & H bombs. His wife Suzu also demands that a world without any nuclear weapons should be realized sometime during the lifetimes of the Hibakusha and their families. And, in Shizuoka Prefecture, we carry out March 1st Bikini Day events every year mainly in Yaizu City. In solidarity with Shizuoka Prefecture, the mayors of Hiroshima and Nagasaki send a message to the March 1st Bikini Day Rally. The Shizuoka governor, the Shizuoka Prefectural Assembly chair, and 75 municipality heads and assembly chairs (the number is almost all municipalities in Shizuoka Prefecture) also show their support for the rally. In recent years, we have been making efforts to develop cooperation with a wider range of the prefectural people. Especially, in Yaizu City, where the home port of the Fifth Lucky Dragon is located, we have organized the March 1st Bikini Day Rally for the last two years with the participation of the Yaizu mayor, deputy mayor, treasurer, Yaizu City Assembly chair, former director of Local Authorities Confederation, former crew members of the Fifth Lucky Dragon and their families, religious people, doctors, the president of the Chamber of Commerce and Industry in Yaizu City, company presidents, fishermen's cooperative in Yaizu and Ogawa cities, and the Yaizu fisheries promotion center. We achieved the rally with literally all citizens' participation. Encouraged by the Japanese Federation of Democratic Medical Institute (Min-iren). Shizuoka Doctors' Association for Health Insurance took part in the organizing committee for the March 1st Bikini Day Rally in Shizuoka this year for the first time. I believe that through the March 1st Bikini Day Rally, Hibakusha of Hiroshima and Nagasaki along with victims of nuclear arms development throughout the world will band together, show the world the truth of effects of nuclear weapons, and urge nuclear weapons possessing countries to abandon their nuclear weapons. I can say with great confidence that this progress will pave the way for the total ban on nuclear weapons. Common Man, Mythic Vision: The Paintings of Ben Shahn, a retrospective organized by the Jewish Museum in New York City, is now on display at its third and final location, the Detroit Institute of Arts, through October 31. The exhibit consists of 43 of Shahn's works painted between 1936 and 1965, focusing on the artist's post-World War II evolution. Benjamin Zwi Shahn was born on September 12, 1898 in Kovno, Lithuania. Shahn's father, Joshua, escaped czarist persecution of his socialist activities and traveled to Sweden, England and finally the United States, where he was reunited with his family and settled in Brooklyn, New York. At the age of 14, Ben was taken out of school by his mother to become a lithographer's apprentice. World War I interrupted his plans to study art in Europe. Between 1919 and 1921, he attended New York University, the City College of New York and the National Academy of Design, and from 1925 to 1929 traveled throughout Europe and North Africa and studied in Paris. Inevitably, as a sympathizer of the Russian Revolution and the cause of socialism, Shahn came under the influence of the Communist Party, already firmly Stalinized. This was to have considerable consequences for his subsequent development, a subject about which the exhibit's catalogue is entirely silent. He died March 14th 1969 at Mount Sinai Hospital in New York. Much of Shahn's work on exhibit from his two final decades make visual reference to the dangers of nuclear holocaust. The exhibit ends with selections from Shahn's last series of drawings and paintings, The Saga of the Lucky Dragon (1960-1962). The work refers to a highly publicized incident in which a Japanese fishing boat, with 23 fishermen on board, strayed within the range of American hydrogen-bomb testing near the Bikini atoll in the Pacific in March 1954. One of the fisherman, Aikichi Kuboyama, died of disease caused by the fallout. The ink painting, Kuboyama (1961), bears the likeness of a Japanese warrior. The Saga of the Lucky Dragon was shown in New York City in the fall of 1961, only months after the failed American invasion of Cuba, the Bay of Pigs. Illustrates article in Harper’s about the Lucky Dragon, a fishing boat caught in atomic test fallout. Brush and ink, 4 1/2" x 7 1/2"
Each such experimennt is an act of the enemies of the civilisation. Let the records be kept for the progenies to see, if they remain even after all the nuclear tests. A powerful piece! When titan nations fight... the innocent suffer. This part of history will always be in my memory eventhough I am from the nation that was victorious, but what an empty victory. Yet, as people as nation shall we not apply 7 times down 8 times up? Bless you for your open doors, dear Gabi san. I have been working on a series of paintings about the Fukushima Daiichi power plant disaster when an on-line friend gave me a link to this blog page. How moved i am to read here of the Daigo Fukuryumaru and discover the the paintings of Ben Shahn.